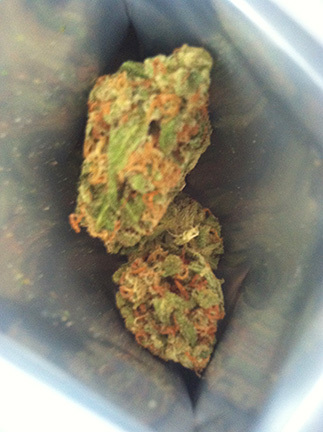 Durban Poison is a strain that has long eluded me, and I’m delighted to say that this week we got some for review. 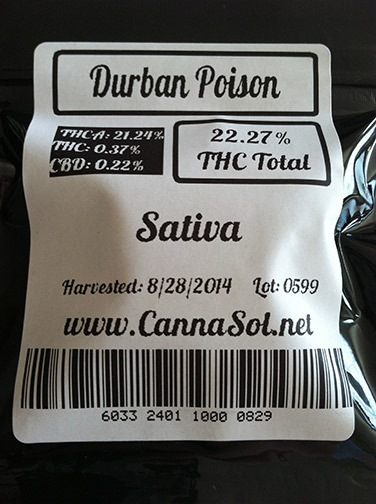 This specific Durban Poison was produced by CannaSol Farms, and it was acquired at Herbal Nation (in Bothell, WA) for the sum of $67.76 for 2 grams. Last week, I reviewed a different strain from CannaSol Farms (in which I highlighted information about the producer itself, their website, and the packaging). 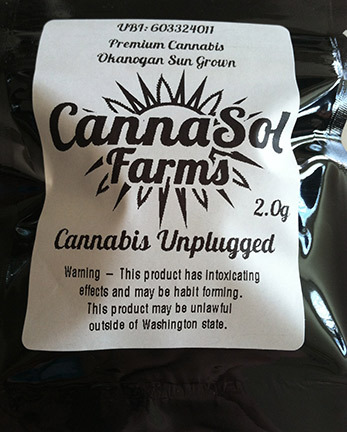 To reiterate, CannaSol Farms is a values driven marijuana producer based out of Riverside, WA. They have a sleek website with information about their mission, their process, their team, and their product. According to their “Our Team” page: the owner of CannaSol Farms, Jeremy Moberg, is a former biologist with plenty of experience in cannabis cultivation and “never stops finding new ways to be involved”. Moberg is also President of the Washington Sungrowers Industry Association, and the Okanogan Cannabis Association. This kind of leadership combined with veteran knowledge will only lead to good things for CannaSol Farms’ future, and it’s inspiring to see such professional individuals bringing their expertise to marijuana production. Looking at the product package for CannaSol Farms’ Durban Poison, I’m sticking by my stance that it’s rustic – yet could probably use some color. The packaging of a product enhances the experience, and maybe it’s just me… but the best package designs I hold on to. In the end it’s just trash, right? But if you can transcend that, create a memory infused with that packaging – well, that’s the best way to get loyal customers. To paraphrase a young John Stewart in Half Baked, “have you ever seen this package… on weed?” Yes, I have – and it’s pretty much just black letters on a white sticker. With an open of the package, I was immediately attuned to the beckoning fragrance. A slight spicy nature, accompanied with a lemon zest. Durban Poison is far from toxic in the smell department. 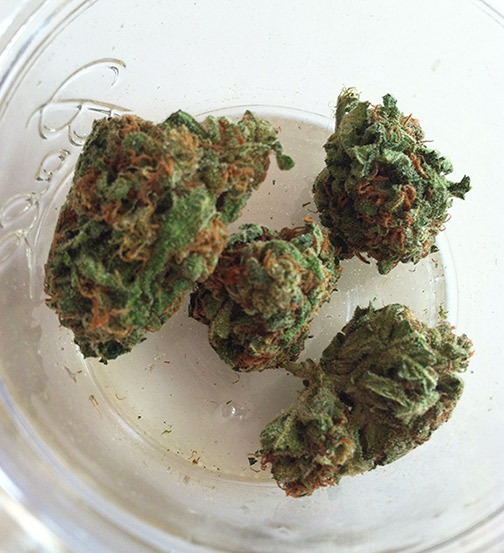 The nugs themselves are spectacular, and snap apart in a manner that sends crystal kief fragments flying. This author found Durban Poison to be cured excellently, and regardless of the leaves – the product is of a visual top notch. Tasting Durban Poison is smooth, and goes along with a cuppa tea. The subtle spice aroma carries over to create a peppery taste, with notes of lemon. Enjoying a good marijuana strain is like enjoying a good wine, and it’s important to discern what flavors you taste. Durban Poison’s high packs a wallop. 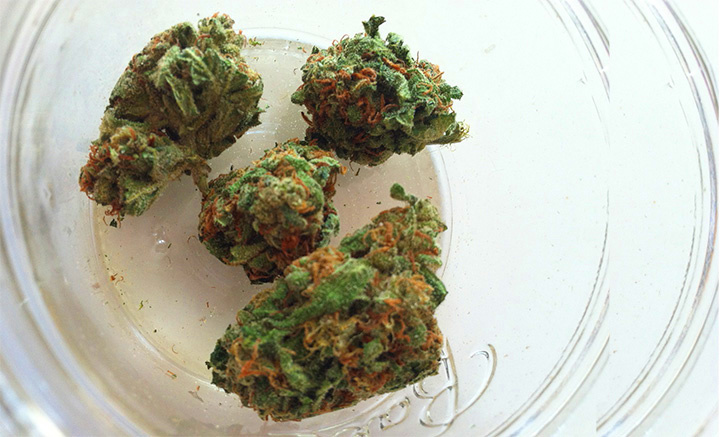 It’s a strong sativa that will seriously get you stoned, don’t let your tolerance fool you. The feeling is incredibly clearheaded, with no sign of heaviness. It’s an uplifting experience, and is by far one of my favorite strains I’ve ever sampled. Like I said, this was like a mythical goal for me. Attaining Durban Poison has always been a pipe dream, and after getting high with this specific strain I can attest to the fact that it may be one of the greatest buds out there. CannaSol Farms has once again delivered a stellar bud, and High Above Seattle will certainly be keeping an eye on their products, and their impact. *I noticed that the information was different on the back of the Durban Poison packaging compared to the Alice in Wonderland packaging (both CannaSol products harvested on the same date). On the back of Durban Poison, the term “THC total” is used – and for Alice in Wonderland, the term “Total Active Cannabinoids” is used. Can any of you readers explain why they would print two different phrases like that? Or are the two terms synonymous? UPDATE: Check out the rest of our marijuana reviews and Seattle pot stores.